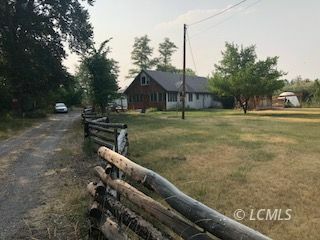 This custom built home has 1729 home with lofts, 2 bedrooms, 2 baths located on .95 acres at the far west end of West Street in Paisley, OR. The beautiful spiral staircase takes you to an open loft area that could be finished for one or two more bedrooms. The location of this home is it's best asset with the Bagley ditch all along the south border. There is also an adorable one bedroom cabin with bath for guest quarters. There is an easement for the driveway which is shared by the landowner to the south. You need to schedule to see this unique home in this quiet ranch community very soon. It will not stay on the market long as there are very few homes that become available in this historic ranch community.